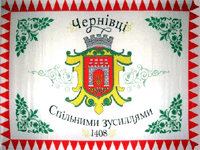 Chernivtsi Oblast (Ukrainian: Чернівецька область, Chernivets’ka oblast’ Romanie: Regiunea Cernăuţi) is an oblast (province) in wastren Ukraine, borderin on Romanie an Moldovae. It haes a lairge variety o landforms: the Carpathie Muntains an picturesque hills at the fuit o the muntains gradually chynge tae a broad pairtly forestit plain situatit atween the Dniester an Prut rivers. Its caipital is the ceety o Chernivtsi. The region haes a population o 913,275 an spans 8,100 km². Chernivtsi Oblast covers an aurie o 8,097 km². It is the smawest oblast in Ukraine, representin 1.3% o Ukrainian territory. In the oblast thare are 75 rivers langer than 10 kilometers. The lairgest rivers are the Dnister (290 km), Prut (128 km) an Siret (113 km). The oblast covers three geografic zones: a forest steppe region atween Prut an Dnister rivers, a fuithill region atween the Carpathie Muntains an Prut river, an a muntain region kent as the Bukovinian pairt o the Carpathie Muntains. Athin the oblast the naitional border o Ukraine wi Romanie extends 226 km, an wi Moldovae 198 km. At the locality level, the territory o the oblast is dividit atween 11 ceeties, 8 touns, an 252 communes. This page wis last eeditit on 4 August 2017, at 16:14.